Washington, Jan 25 (Just News): The US President Donald Trump has for the first time said he is prepared to be questioned under oath as part of an investigation into alleged Russian meddling in the 2016 US election. He said he was "looking forward" to it, subject to the advice of his lawyers. Investigators are assessing if the Trump campaign colluded with Russia to influence the election in his favour - a claim denied by Mr Trump and Russia. Investigators will also determine if Mr Trump obstructed the inquiry. The US intelligence community has already concluded that Moscow tried to sway the presidential election in favour of Mr Trump. The president had previously said he thought an interview was "unlikely" because there had been no collusion. He has called the Russia investigation a "witch hunt" and a "hoax". 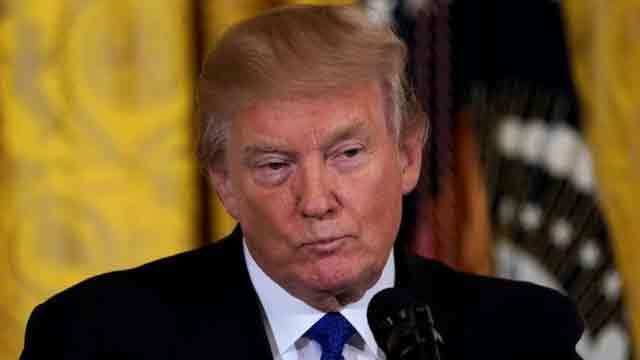 Speaking at the White House on Wednesday, Mr Trump maintained he was "absolutely" prepared to be questioned under oath by the top investigator. "There's been no collusion whatsoever, there's no obstruction whatsoever," he said. How will Trump's questioning take place? The president's lawyers have been talking to the investigation team led by justice department special counsel Robert Mueller about an interview, and the form it might take. As to when it might happen, Mr Trump said: "Yesterday they were talking about two to three weeks." Asked if he thought Mr Mueller would be fair, the president replied: "We are going to find out... I hope so." What else did Trump tell the press? Mr Trump told reporters that his former rival Hillary Clinton was not prepared to be interviewed under oath by the FBI about her use of a private email server. The Republican president also said he did not recall asking an acting FBI director about his voting record. "I don't think I did," he said. "I don't know what's the big deal with that." Andrew McCabe, who took over the FBI after the president fired its previous director, James Comey, last May, said he found Mr Trump's Oval Office question "disturbing". Mr McCabe said he told the president that he did not vote in the 2016 presidential election, according to the Washington Post. Mr Mueller is thought to be investigating whether Mr Comey's firing was an attempt to obstruct justice. What's happened in the inquiry lately? US Attorney General Jeff Sessions was interviewed by the Mueller inquiry for several hours last week. The country's top prosecutor is thought to be the first member of the Trump cabinet to be questioned. Four people have already been criminally charged as part of Mr Mueller's investigation. Michael Flynn, the president's former national security adviser, pleaded guilty to lying to the FBI about a meeting with a Russian ambassador. Mr Manafort's business associate Rick Gates was also charged with conspiracy to launder money.